Ok, you’ve probably seen these wooden pallets lying around everywhere, right? I sure have. Any construction site or store will have about a gazillion of these things on-hand. 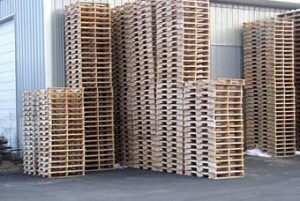 The sobering thing is that most of the time these wooden pallets are just carted off to a landfill when the person or company is done using them. Wasted. But, we can give these wooden pallets a new life by turning them into all sorts of useful things. People have used wooden pallets to build barns and homes, and even outdoor toilets. Today, thanks to some help from fellow blogger and friend Renaissance Ronin, I wanted to talk about how easy it is to turn these pallets into a large, outdoor compost bin for yard clippings and leaf waste. A good bin has four strong sides… unless you’re a rabblerouser with the desire for a pentagonal or even octagonal compost bin. You can do whatever suits your fancy, but me… I’m all about keeping it simple. Create a four-sided bin by nailing or wiring together four wooden pallets in a cube, leaving the top and bottom open. The finished bin will look like a wooden cage. I like to use scrap “L” brackets instead of nails and wire, they hold better and they look “cool”. You need a gate. Attach one pallet with a hinge on one side. Swing the pallet “closed” and then wire it shut. You don’t want it opening, unless you tell it to. Lay a pallet flat on the ground in the location of the compost bin. This bottom pallet increases the air flow under the compost pile. This is GOOD. But, something good always costs you something, right? That airflow will dry out your compost faster, so even thought it’s a better situation, it will cost you some water. Place your new “compost cage” on top of the pallet that you placed on the ground. Feel free to kick it a few times, first. And resist the urge to make it easier to clean up the mess and place your compost bin on soil or grass instead of concrete or patio tiles. Concrete and patio tiles give off a ton of heat that will dry your compost out even faster. You need something to add some structure to the bottom of your compost pile now. So, break out the tree trimming gear or your hedge clippers, and chop away! Use the debris to add a layer of sticks and twigs to the bottom of the compost bin. Compost works better if you chop everything up first. So, it’s more work, but go berserk on the bushes, and then shred up everything that you can, before you toss it on the compost pile. Continue adding layers of compost by alternating “brown waste” and “green waste”. And remember… Chopped waste will compost faster than large pieces. Seriously. Unless you want to wait five years for composted soil for your container gardens, do yourself a favor and tear that waste up first. Besides, it’s a great way to get some “stress relief” after your spouse “helps” you with the chores. Lightly water the compost, but don’t overwater it. You want the stuff to start breaking down, not drown. Don’t allow the compost to become sopping wet. It’ll just rot, smell, and make the neighbors mad at you. Water your composting waste periodically when the compost becomes “dry”. Turn the compost over in the bin periodically with a pitchfork to speed the decomposing process. In almost no time at all, you’ll have the coolest soil on the planet for your garden. Building your own pallet compost bin is a great way to save money (I just saw Home Depot carrying compost bins now…for $100+) and help keep these pallets out of the landfill. And, they work really well! 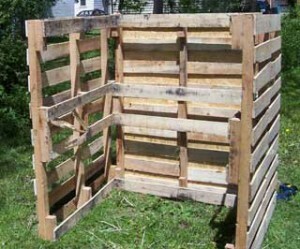 Have any of you ever used pallets to make an outdoor compost bin? If so, I’d love to hear about your experience! How to Compost at Home with a Composting Bin :Home Compost! Home Composting – Step 2 – Getting the right mix :Home Compost! Product Review: Urban Compost Tumbler Bin :Home Compost! Passed on this great info. What a great post! I’m just wondering….if you’re not supposed to “drown” the compost pile but just keep it wet, how do you keep rain off of it? Is there some type of cover that it should have?